I started by baking 3 round vanilla cakes. Once cakes were cooled, I drizzled strawberry jelly over the top, allowed to soak in a bit and placed cakes in fridge to set. I made a batch of buttercream icing and flavored it with strawberry essence. I sandwiched all cakes with icing then trimmed the cake top to the shape of skirt. Next, I removed the legs from the doll and covered bottom in cling wrap. I made a small hole on the top of the cake layers and inserted doll and secured it with icing. I covered the skirt and body with icing and used a spatula to create swirls. I colored a little cream with darker pink coloring and used it for the base of the skirt and decorations. I used sugar roses and silver balls to finish off the decorations. Finally, I placed 13 long candles in the back. 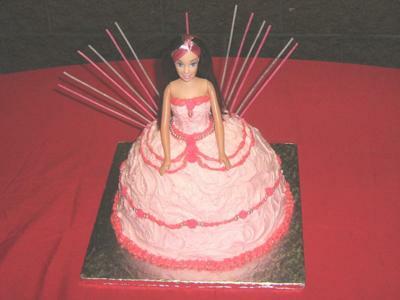 I made this cake for my niece Rical Andrea Chetty on her 13th Birthday. Hi Sis, Thanks. Know I can always count on your support. Very creative and to think all this was done from scratch. You would think it was done by pro's. Keep it up. Can't wait to see the next cake invention. Trust me it tasted as good as it looks. Hi Nancy, Thank you, she did love it. She is darling, I bet your niece loved it. Keep up the good work.